Yesterday at USC Dr. Charlie Lane, associate senior vice president for Career and Protective Services, announced at a bicycle safety forum that the school is enacting a bicycle ban on Trousdale Parkway and Childs Way, the two major pedestrian thoroughfares on the USC campus. With near 80% of USC students self-identified as bicyclists (another survey estimated up to 15,000 bicyclists on campus), the effects of this new measure could be quite drastic. Given better planning and educational efforts, this situation may have been avoided. A thing of the past? USC bans bicycles on major pedestrian thoroughfares. The areas currently under ban for bicycle riding are Trousdale Parkway and Childs Way (map), the primary north-south and east-west thoroughfares through campus, each almost half a mile in distance. Trousdale Parkway is currently listed as a bike lane in Metro's new bike map and is listed as a bike path facility by google. As of Tuesday September 14, bicyclists must walk their bicycles on these two thoroughfares from 9AM to 4PM. USC's Depart of Public Safety (DPS) has decided that conditions have become so hazardous on campus that a ban needed to be put in place. In a survey of USC students, a majority had reported being struck by a bicycle 2 or less times in the past year. DPS blamed the safety problem on the enormous growth in bicycles over the past few years and attributed the rise in accidents to bicyclists "texting and sipping a latte while riding through campus". The plan calls for the creation of bicycle parking facilities on the very edges of campus, making the campus core a pedestrian-only zone. The Department of Public Safety cited the expense and manpower involved in appropriately supervising bicycling on campus as a reason for needing to push bicycles to the edge of campus. Although Dr. Lane claimed that students also considered bicycles a problem on campus, it was later shown in his presentation that a majority of students considered bicycle congestion to be either "average" or "not a problem". Further recommendations for the school include encouraging incoming freshman not to bring bicycles and stronger enforcement of bicycle restrictions. Bikes on Campus – What's the Real Problem? While Dr. Lane and DPS seemed to classify bicycles themselves as the problem at USC, it is the school's response to date (i.e. none) towards a growing bicycle culture which has caused the problem. The growing popularity of bicycles is a trend that should be embraced, not shunned; alternative modes of transportation should be encouraged at all times. By relegating bicyclists to the edges of campus, bicycles are being de-legitimized. The problem, it seems, is not that a large number of bicycles are being ridden on campus, but rather the behavior of those bicyclists and the consequences of that behavior in relation to pedestrians. While DPS rightfully claims that they do not have the resources to police bicycle behavior, providing proactive solutions like education and infrastructure (rather than DPS's currently reactive solutions) provide a low-cost, long-term solution to bicycle congestion on the USC campus. Currently, USC has no training, information, or classes on safe bicycle riding beyond a website mainly concerned with registration and parking. 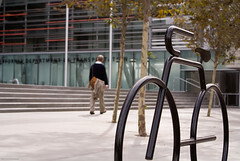 Inserted as an educational element during orientation or as an online seminar, USC could educate incoming students on how to not only ride safely on campus, but also the bicycling laws of Los Angeles and California. Because many USC students come from either out of state or even out of the country, they often don't know what is expected of them as bicyclists. USC also has no on-campus infrastructure for bicycles. 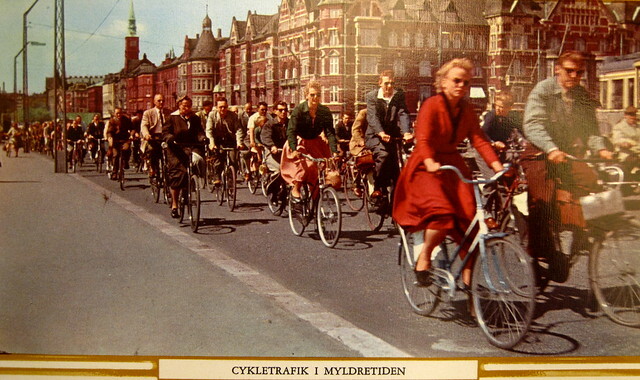 With nowhere clearly marked for bicycles, it is no surprise that bicycle/pedestrian conflicts have arisen as bicycle culture has become more popular. While instituting pedestrian-only areas within campus can be a sound safety measure, it needs to be coupled with equal bicycle-only infrastructure on campus. By providing space for bicycles, conflict with pedestrians can be minimized. While it certainly is true the there are limited opportunities for traditional bike lanes on a built-out campus like USC, there are still many creative solutions which would improve bicycle and pedestrian safety. On the current streets on the USC campus, bike lanes or Sharrows could be installed to give bicyclists greater confidence to use those roadways rather than pedestrian areas. On wider thoroughfares, aesthetically pleasing treatments could be applied to delineate space for pedestrians and bicycles which could easily fit into the campus' architectural theme. Another complaint against bicycles was the overflow demand for parking and the ugliness of existing bike racks. 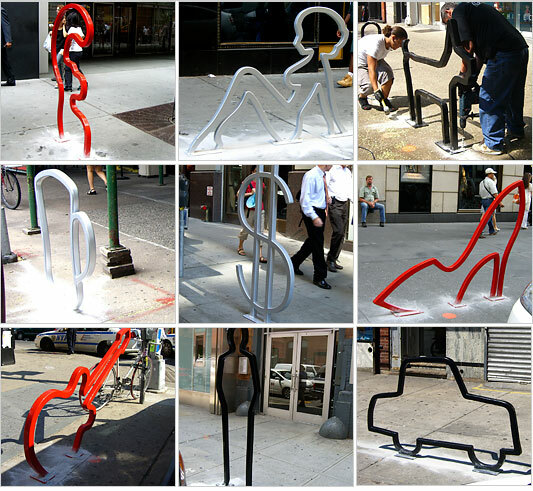 The idea that bike racks are ugly, however, is something of a dated concept. Art racks have been installed in major cities across the world and can add to the beauty of an area rather than detract from it. Even in Los Angeles there are examples of art racks which contribute to the street aesthetic. Additionally, providing U-racks at dormitories can function as longer-term or night-time parking for bicycles, freeing up the existing day-time racks on campus that currently get used for long-term purposes. We hope that USC will reconsider its plans to marginalize bicycles on campus. With an innovative approach, bicycle/pedestrian conflict can be minimized at little cost. We also hope that USC will reach out to regional bicycle organizations like the LACBC or LADOT – Bikeways when considering how to accommodate bicycles on their campus.